Healthy, multi colored plant based foods can have so much interesting effects on the body from enhanced health, more energy and it can even be naturally nourishing your skin if you do it right. As we age stuff happens, that is the stage I start to find myself in. I’m not obsessed with not aging but if I learn about the benefits of certain foods and little changes I can make and add some to my diet I will do that. I have been reading up on natural skin care and on things we can do and eat to enhance and keep collagen production going for a better quality skin. Collagen is needed for a younger looking skin, we all have heard of that for sure. Collagen is the most common protein found in the body and it works like glue to bind cells together. It keeps our skin firm and young looking, keeping it wrinkle free and tight. Collagen is also found in our tendons, fat, ligaments, organs and many other places in the body. The production of collagen starts to slow down from an age of 25 but we for sure have some influence on this fact. 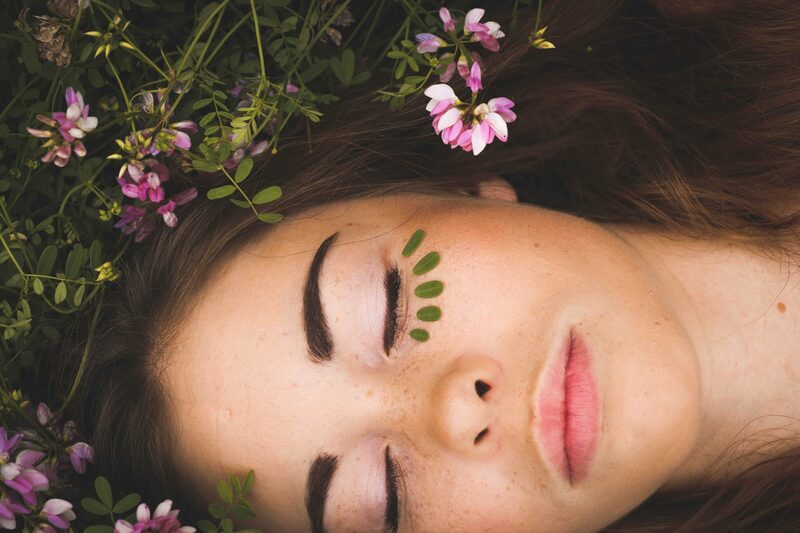 There are ways to enhance or keep the production of collagen going thanks to diet, topical care, protection against UV rays and things like adequate sleep and exercise. Avoiding the usual suspects like smoking cigarettes and processed sugar is also needed for these destroy our natural collagen fibers. Mother Nature is so wise. Our body is able to produce collagen given the proper nutrients. A tiny cell called the “fibroblast” is the cell located in the dermis, responsible for making a fibrous tissue known as your connective tissue or collagen. This is the only way the human body makes collagen. Ingesting it or applying it to the skin does not work as efficient, for the best results it has to be secreted inside the cell. Collagen supplements seem to be targeting joints and ligaments and not the collagen found in the layers of the skin but as with many health info there are contradictory studies about the benefits of these products out there. As far as I’m concerned the complete form of nutrients is what our body strives on, not parts of it derived from the elsewhere and made into a pill. Fibroblast need collagen precursors to boost collagen synthesis in the skin. 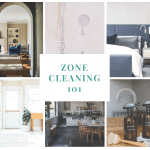 This works from the inside out. 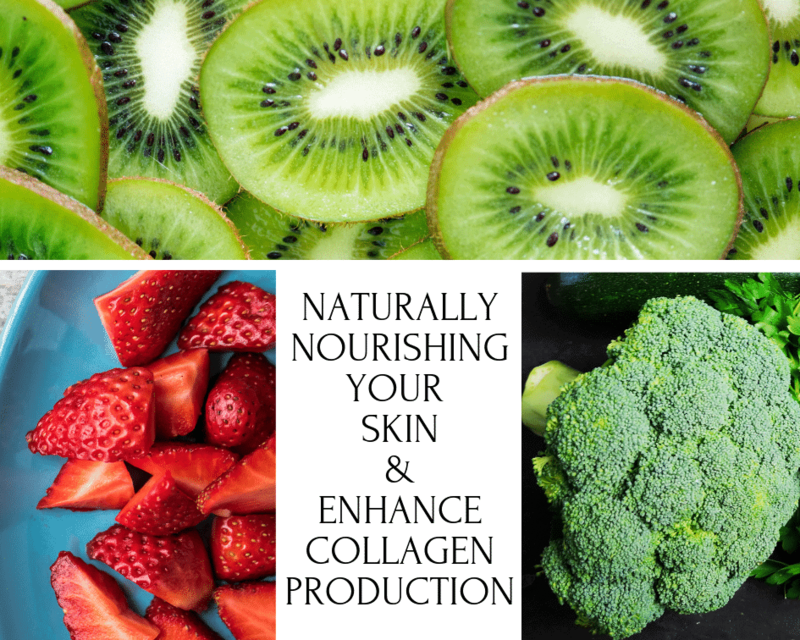 We need the following vitamins and nutrients listed below to make healthy strong collagen for a young looking skin and to repair wounds and scars. I am always for getting our nutrients from whole foods but in sometimes a day just is crazy and a week flies by and we don’t get enough good stuff in, in that case this is the only collagen builder vitamin I would use, made of real food, vegan and natural. Vitamin C found in most fruits and vegetables, I list them from the highest down, Black Currants, Red Pepper, Kiwi, Guava, Green Bell Pepper, Orange, Strawberries, Papaya, Broccoli, Kale, Parsley, Pineapple, Brussels Sprouts, Cauliflower, Mango, Lemon, Grapefruit, Honeydew, Peas and Tomatoes. Vitamin C is one of the major players in the game of collagen production, it interacts with amino acids within the cells. 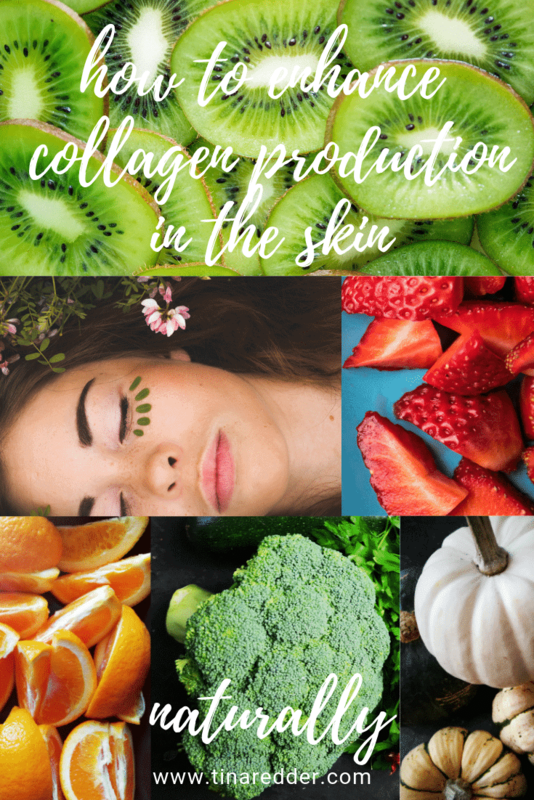 If you don’t get the proper amount of vitamin C, collagen production will slow and make skin more susceptible to wrinkles and even to bruising. Copper peptides found in Shiitake Mushrooms are the highest vegan source and also Cashews, Chickpeas, Kale, Cacao Powder, Sesame Seeds, Quinoa, Almonds, Lentils, Chia Seeds and Avocado are good sources of copper. Bioflavonoids found in fruits like Citrus and Berries, vegetables like Broccoli and Kale, fresh herbs like Oregano, Parsley, Peppermint and Thyme. Also present in black, green and red (rooibos) Tea. Organic dark chocolate is also a great source of flavonoids as are Soy Beans, dark colored Beans, Pecans, Walnuts, Pistachios, Cashews and Buckwheat. HGH, human growth hormones, naturally found in the body, especially when young. HGH production also lessens with age but intermittent fasting seems to have an elevating effect on HGH production in the body. Sulfur helps to rebuild collagen fibers that have been damaged over the years. Garlic and its close cousins Shallots, Leeks, Chives and Onions are the best dietary sources of sulfur. Essential Fatty Acids are needed for all cell functions and healthy cell membranes. 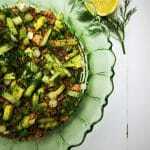 Add some Flax-, Hemp-, Pumpkin- and Chia seeds, Walnuts and Brussels Sprouts to your daily diet. There are a lot of healthy, nutrient dense foods that can support a younger looking skin. A whole foods plant based diet is a great place to start. I list a few more special cases below, the leaders in skin rejuvenation. Linolenic acid is a powerful anti-aging factor for the skin. Linolenic acid is rich in antioxidants which we need to fight the free radicals cruising around in the bloodstream. Free radicals are like a crazy bunch destroying everything they come across, they also break down healthy skin cells which causes visible aging. Cilantro is rich in the linolenic acid needed for this job. Also Flax Seeds, Camelins-, Sacha Inchi-, Chia- and Hemp Seeds, Walnuts, Pecans and Wild Berries are a good source. Ginseng is another powerful anti-aging ingredient. It has been found to stimulate the growth of collagen in the skin. Ginseng also protects the skin against UVB rays as unprotected sun rays have an aging effect on the skin. The antioxidants found in ginseng can protect healthy cells and contribute to glowing younger looking skin. Aloe Vera gel has been used for healing and soothing wounds for ages. Aloe Vera increases collagen production when applied topically. The reason why the skin heals so fast after a sun burn when aloe gel applied is due to its cell-growth stimulating property, it boosts collagen production in the skin. 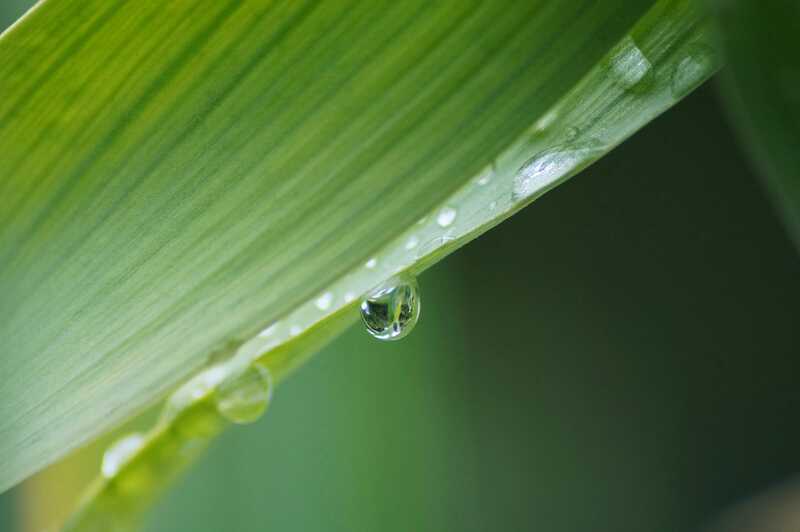 Hyaluronic acid is another skin care ingredient needed for a better quality skin. There are all kinds of serums concentrating on hyaluronic acid but I like to double it up and work also from the inside out. There are foods rich in hyaluronic acid and there are foods that encourages the body to make more of it. Enjoying plenty of these foods is therefor beneficial for a healthy young looking skin. Bananas are one of the only fruits known to be rich in hyaluronic acid. 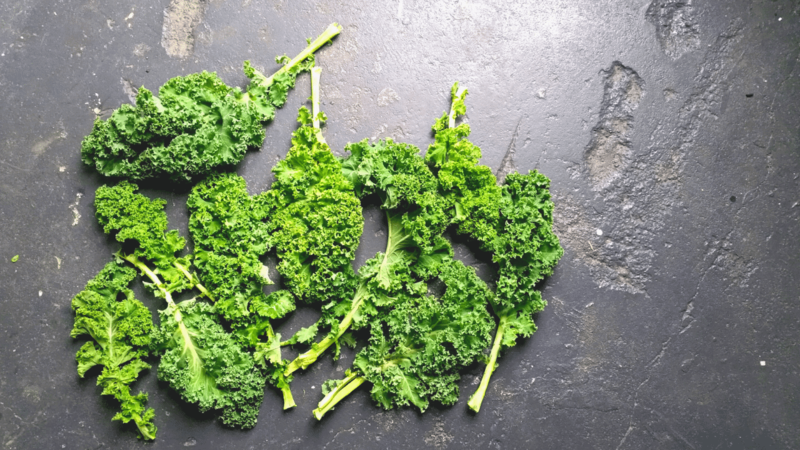 They are also rich in potassium and magnesium which help the body in the making of more of the good stuff. Sweet potatoes and Soy support the body in making hyaluronic acid. Zinc is also essential for the production of hyaluronic acid. Whole grains like Brown Rice and Oats are rich in zinc. Vitamin C is again the critical factor, like with the production of collagen, here needed the synthesis of hyaluronic acid. This combination is necessary, without it the body can’t use it optimally. Hyaluronic acid is needed for the collagen production in the body, this is also something that decreases with age like all everything it seems …. 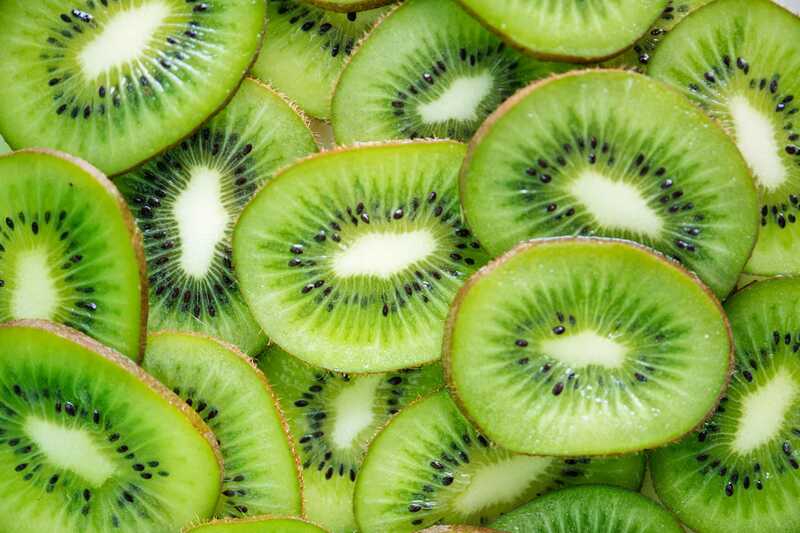 But eating lots of vitamin C rich foods like Citrus, Bell Peppers, Broccoli, Kiwi, Strawberries is something we can do to support a younger looking skin. 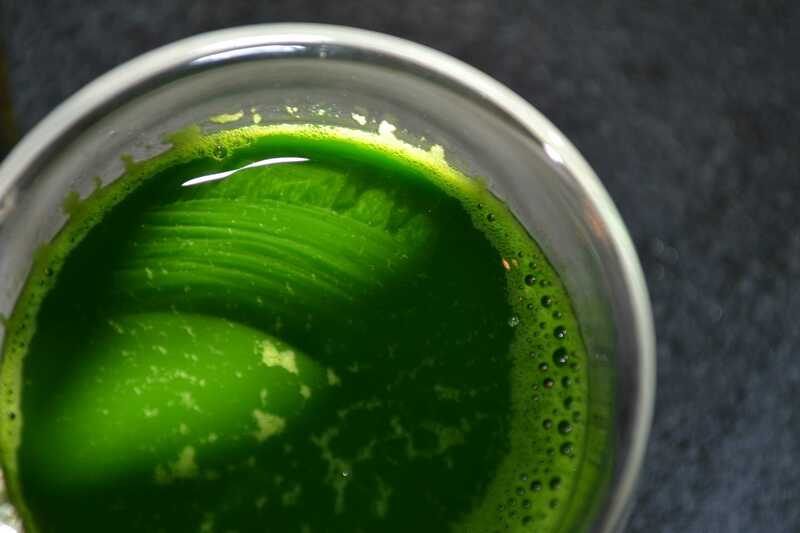 Chlorophyll increases the precursors to collagen in the skin which means everything dark and vibrant green gets the thumbs up. when we feed our body the right way our skin can produce new collagen. When we also consume lots of anti-oxidant rich foods these protect us against free radicals that break collagen down and visibly age us. Build and protect.